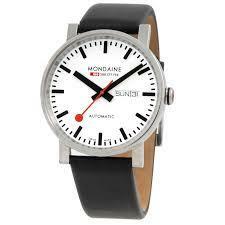 Mondaine watch, collellezione Ages. Automatic movement. Polished steel case 40 mm, white dial. Glass bottom that allows you to see the movement. Evo Automatic unites tradition and design. 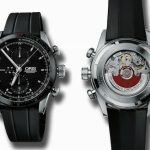 Shining example of innovation and design, the Oris Artix GT Chronograph is the latest addition to the Oris family. Realized thanks to the experience gained from Oris in the world of motor sport, this watch combines timeless design with sporty elegance. 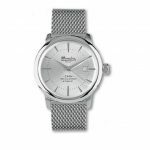 Rubber strap, stainless steel case measures 44.00 mm, sapphire crystal domed on both sides with anti-reflective coating. Mondaine special edition watch, movement ETA 2892-2, brushed steel case 41mm, sapphire crystal and black leather strap, silver qudrante. Very few specimens Produced. Just fine !! 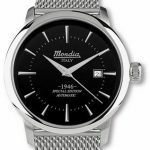 The timepiece Mondia Italy Special Edition “1946” inspired by the classic style and timeless watches used in the 40s, an era that has influenced customs and trends. It was in fact the year 1946 when he appeared for the first time, the advertising of a watch Mondia Italy. 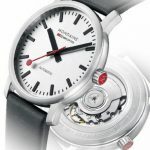 All models Special Edition “1946” are equipped with the caliber Miyota 821A, a mechanical movement with automatic winding function only time and date display at 3 o’clock. The mechanism is housed in a stainless steel case and black PVD rose gold with a diameter of 42 mm. The dial, protected by mineral glass crystal, èdisponibile in silver, blue, black and champagne.